OCCC is stocked full of vending machines. In fact, they’re almost everywhere you look. A harried student running from one class to another may be tempted to plop some coins in the slot and grab a candy bar or bag of chips. No wonder freshmen are said to gain an average of fifteen pounds. However, some of us aren’t content with consuming food and drinks that are high in sugar, sodium, fats and calories, and other ingredients that might taste good, and have no real nutritional value. 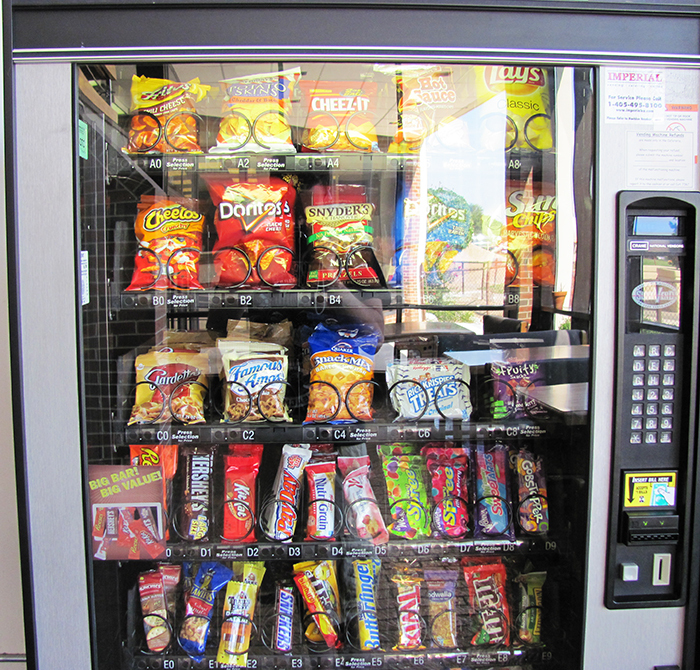 These machines set a very bad precedent in teaching unhealthy eating habits, which usually follow the students home. It is more difficult if you want healthy food choices. The only option is to walk across campus to the food service are. The problem with this is the food service area isn’t open for night classes. At lunch time, there is sometimes a very long line to stand in before students get inside and then, they may stand in another line to order what they want. If you’re a vegetarian, diabetic or have religious and dietary restrictions on foods, the selection in the cafeteria is limited. The pricing also is not affordable for all students. Doctors advise patients to eat the largest meal in the morning, the next largest at midday and only a small meal at night. For most of us, that would require eating while on campus. Why is it that there are no vending machines that contain healthy choices? During the summer, I worked for an insurance company call center that was committed to helping employees stay healthy. There were several vending machines containing an assortment of foods in the cafeteria area. The selections included sandwiches, TV Dinners, fresh fruit, raw vegetables with dips or a salad and even ice cream. Even the drinks were healthy. Employees could choose milk, orange juice, protein drinks or others. I don’t know about everyone else, but it’s refreshing to be able to pop some coins in the slot and sit down to a healthy meal even when I’m away from home. Considering that OCCC has one of the best nursing programs in the state and offers classes on nutrition, I’m surprised the only vending machines on campus are full of food that’s laden in fat, full of preservatives and high in calories. I asked some students what type of food they would like to see in a vending machine and they replied that they’d like vegetable cups, strawberries, grapes, cheese, small TV dinners, fresh unsalted nuts and milk or juice to drink. I’d like to see salads, nuts, cheese sticks, yogurt, sunflower kernels, pretzels, popcorn, fruit, and pre-cooked dinners to heat up such as lasagna or enchiladas. On a side note, why are we paying so much for what we buy? A small pack of gum that runs between 25 to 35 cents in a convenience store is 75 cents in our machines. That doesn’t make sense. Unfortunately, it doesn’t seem that we’ll see positive changes in this area anytime soon.